No matter how organized a mom you consider yourself, I know I can become quite incensed when I can’t seem to get to the bottom of my bag to retrieve some crayons for my daughter. Even when I remember coloring books and other gear to keep her occupied while we’re dining out, those pesky crayons are always tough to unearth from my sea of used tissues, chewing gum wrappers and the like. That’s why I really like the Art-To-Go-Roll . 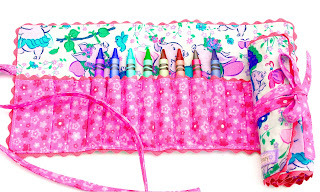 It’s a roll-up cotton holder with 14 soft pockets that hold all the art essentials–plenty of space for crayons, markers, colored pencils or your little artist’s medium of choice. The spacious pockets make it simpler for little fingers to retrieve and return their art supplies themselves, and yet it stores easily in my ever-bulging bag. Now I don’t have to replace as many broken crayons as before and my own pint-sized Picasso can finish her latest masterpiece before the food arrives. In a Nutshell: When you’re ready to roll, don’t forget to grab the Art-To-Go-Roll before heading out the door. Your waiter will thank you, too.